What happens when curiosity and creativity combine to test a scientific theory? 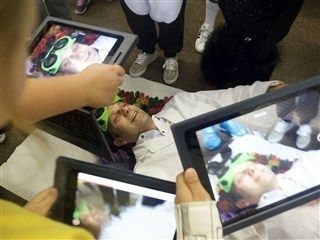 Early Childhood students watched in wonder as students and STEAM teacher Brad Buckner demonstrated the answer. 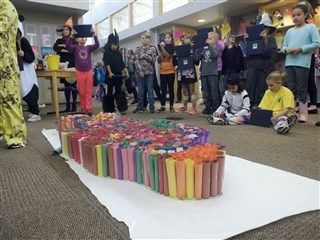 When grade 3 students wondered how much weight a paper table could support, STEAM teacher Brad Buckner decided it was a perfect opportunity to let them puzzle out the answer on their own. The design process started with one important question: “What if?” Students started exchanging design ideas. They traced their teacher’s outline on a long sheet of paper and got to work. They built, tested and re-evaluated. Students in STEAM class learn that when they test a design, it might not work the first time—and that’s not a mistake, but an opportunity. What might seem impossible—or at least improbable—at first can be achieved through teamwork and trial and error. 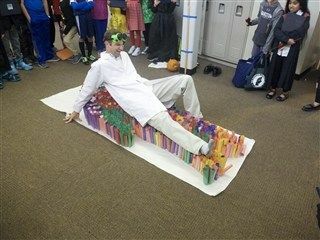 Working together, students made paper tubes by the dozen and filled in Mr. Brad’s shape, essentially building a colorful paper table. And guess what? They were right! The paper table not only held Mr. Brad’s weight, he said it was actually quite comfortable. 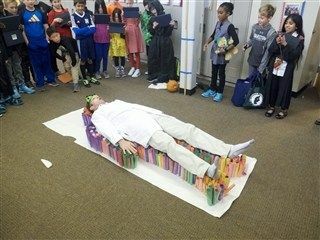 “The students learned a lot about the concepts of balance and distribution of weight, and it was really all directed by them and what they wanted to find out,” he said.